Years ago, for environmental reasons, the U.S. government joined a global consortium mandating the replacement of all CFC type refrigerants in favor of those with lower ozone depleting properties. This new requirement was the basis for the introduction of the R134a refrigerant into the automotive industry. RT Dygert offers this 200 piece assortment of O-Rings in the 12 most popular automotive A/C sizes. 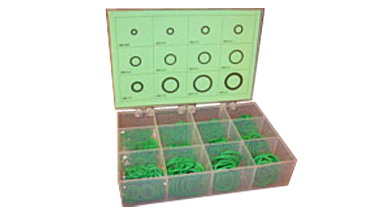 The material used to produce this kit is a green, highly saturated nitrile or HNBR. HNBR offers excellent resistance to R134a refrigerant and elevated operating temperatures, as well as resistance to the synthetic oils used as lubrication within the compressor. Material is 70 durometer green HNBR (highly saturated nitrile). For more infornation on this material, click here.